Victoria has an amazing diversity of different habitats along our coastline. Each of these habitats contains a particular combination of animals and plants, many of which are only found in Southern Australia. A habitat is a place where animals and plants live. They are usually named after the most obvious plants or animals that live there. Some of these Victorian habitats include kelp forests, sponges gardens, and seagrass meadows. In other cases the type of environment in which the animals and plants live names the habitats. These include rocky reefs, mudflats and sandy plains. and the surf charged sandy environments of popular surfing beaches such as Bells Beach near Point Addis. What are some of Victoria's marine and coastal habitats? Victoria's Rocky Reefs are fascinating habitats that are rich in life. Many marine animals and plants need to attach themselves to something solid for their survival. While we do not have reef building corals in Victoria many of our rocky reefs are covered in brightly coloured animals and plants. Reefs are found where rocks occur above or below the waterline. As the rocks are eroded by the action of water, cracks and holes appear which increase the availability of shelter for living things. Different rock types weather in different ways and may have different species. Rocky reefs that are exposed at low tide are great places to explore as there are many animals and some plants that can survive out of the water for some time. The presence of rockpools, crevices, and boulders increases the diversity of life because of the shelter provided. Below the low tide mark rocky reefs can support extensive communities of marine plants which can form kelp forests. Seaweeds that form forests are a special group of large brown algae called kelps. These large plants attach themselves to solid structures such as rock, and extend their leaves into the waters above them reaching towards the sunlight. These larger algae in turn create a habitat for smaller algae and a wealth of animals that can either live attached to the rocks beneath the kelps, on the kelps themselves, or in the sheltered waters between individual plants. In the same way that trees provide shelter and food for many different species, kelp forests are the true forests of the sea. Because the kelp forest has a dense canopy of blades blocking out light it can result in shading of the rock surface providing an ideal environment for an understorey of encrusting algae and non-moving animals. Reefs that are hidden from sunlight in deeper water, or under ledges, often have brightly coloured communities of invertebrates, many of which rival coral reefs for colour and diversity. These sponge gardens contain many animals that filter their food from the water and include a number of species that are poorly known to science. By protecting these some of these areas as Marine National Parks and Marine Sanctuaries we are ensuring that species are not lost before we can learn about them. 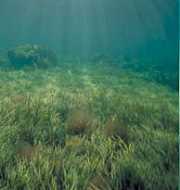 In the sheltered parts of many bays and estuaries, flowering plants called seagrasses can establish extensive underwater meadows that are some of our most important but challenged coastal habitats. Seagrasses are critical in the life cycles of many of our important fish species as well trapping of sediments before they enter the sea. While eaten directly by very few animals, the seagrasses provide shelter as well as contribute large amounts of plant material that breaks down to form detritus, a major food source for many invertebrates living in the seagrass habitat. Seagrasses in Victoria have suffered from massive decline in the past three decades with declines being most serious in embayments with catchments that been extensively modified for urban or agricultural development. As seagrasses may take many decades to recover once lost, seagrass decline is a major community concern. Loss of seagrass leads to reduced habitat for many commercially significant fish and internationally important bird species. In places where low tides leave muddy sediments exposed to the air there may be few larger plants. These mudflats however teem with worms and other small animals, which provide an important food source for wader birds, some of which come from as far away as the Northern Hemisphere. Far from being sandy deserts some of our sandy environments have a surprising wealth of life. These areas are home to a range of tiny plants and animals. Many small animals can live in the spaces between the sand grains while large animals hide beneath the sand. Scientific surveys have shown that these sandy environments can have some of the high levels of biodiversity in the sea anywhere in the world with at one location over 600 different species being found within 10 square metres. Away from the shoreline many animals and plants live in the open waters of Bass Strait or the Southern Ocean. These areas are affected by strong winds, powerful tidal currents, and large waves. Open waters contain organisms that either actively swim or are carried by water currents. In addition birds including a number threatened species such as albatross use the open waters. Many of these species may use the coast for breeding but spend long periods of time out in open waters. Many marine mammals also use our open waters as areas in which to feed or breed including Australian Fur Seals, Bottlenose Dolphins, and Southern Right Whales. Protected from the large waves and winds of the open coast, bays and inlets are important environments around which many coastal towns and cities are located. These areas have different types of habitats within them and are also important nurseries for many species of animals including some commercially important fish. 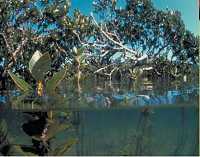 Estuaries and bays are highly productive systems often with a number of shallow water plant species such as seagrasses as well as large numbers of microscopic plants in the sediment and water. Many smaller animals feed on detritus which is formed as dead seagrasses, algae, and other plant material is broken down by microbes. These in turn are the starting points for food chains that lead to larger animals such as fish birds and mammals.